SF Ferry Building, original photography by Joe Ercoli. Epic. Truly Epic. That’s all I can say right now. Shooting conditions were so perfect it was making my head spin and I was so psyched to shoot on my way up to the city. You see, for those of you not in Northern California, we had a couple of days of nice weather and everyone was getting ready for the onset of spring. I know, you’re saying how spoiled we are here in Cali, wearing shorts all winter, blah, blah, blah. Whatever… I digress. We got hit with a little rain storm and people started getting dreary and complaining. Instead, I looked for the silver lining and when there was a break in the rain for half a day, I realized that all of the crap in the air around here would be cleared out and visibility would be at a premium! I grabbed one of my shooting buddies, Tom, and we drove up to SF (I live about 25 minutes away) to scope out some shots from Treasure Island. If you read my last post below you’ve seen some of the panoramas that I’ve been cranking out lately. The difference here is that those shot below were all hand held and at a relatively close distance. Definitely do-able. Last week I rode my bike up to the city to hit a few spots and ended up on TI at sunset and attempted to shoot a couple of panoramas of the city (almost 2 miles away). Unfortunately, my tripod doesn’t travel well on a sport bike so I attempted, once again, to shoot these hand held and, well, failed. I attempted a high res pano with a 70-200mm lens zoomed all the way and ended up snapping off 129 images. The high ISO required in light that low brought too much noise into the images. But I’d be willing to repeat the experience again with a tripod because, just as a proof of concept, it worked! After letting my computer render all night while I was sleeping, I awoke to find a ginormous file on my hard drive (1.12GB) and jumped in to check it out. It went together alright, but the quality wasn’t nearly what I was hoping for. After that experience, I made sure to bring my tripod this time and I stuck to a smaller lens (my trusty 24-105mm L lens) to minimize distortion that could potentially be caused by the light breeze coming around the island. The two panos below are proof of the great shooting conditions that night. There were some low lying clouds over the city, but it was clear as a bell looking across the bay until about midnight when the fog seemed to almost shoot in from the Golden Gate. At that point we decided to call it a night. That is, until, we were driving back across the Bay Bridge and saw that it was still pretty clear along the Embarcadero and decided to head in to grab a last few shots. Just a bit later I grabbed five exposures to create the HDR of the Ferry Building at the Port of San Francisco that leads off this post. 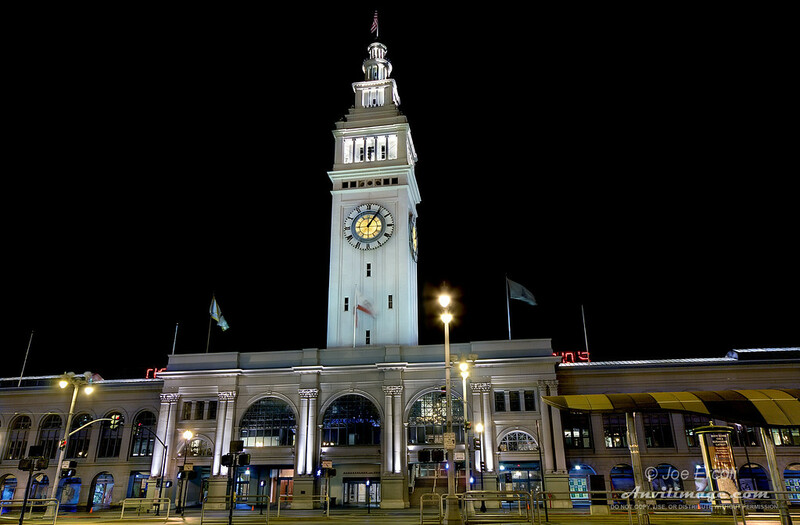 HDR Info: The SF Ferry Building is a 5 exposure HDR images shot on a tripod with a Canon 40D. It was processed in Photomatix Pro and cleaned up in Photoshop with layered exposure blending and other bits. The images were taken using a Sigma 10-20mm lens and here is the complete EXIF. This entry was posted on Tuesday, May 5th, 2009 at 3:13 am	and is filed under Blog, Photos. You can follow any responses to this entry through the RSS 2.0 feed. great serie..very nice compositions and well done night exposures..Bravo! What I love about the Ferry Building picture, is that you combined 5 images (left to right? ), and all of the pedestrian signals show the same condition (walk). Timing is everything.